This limited edition, signed print of a Mort Gerberg New Yorker cartoon is out of stock. Note: Unfortunately, this limited edition, signed Mort Gerberg print is out of stock. See the rest of his collection here. "That's what life is all about in terms of doing things," Mort Gerberg says about change— and the message of this 2014 New Yorker cartoon. Known for his clever combining of wit and social commentary, Mort has been a working cartoonist since the '60s. 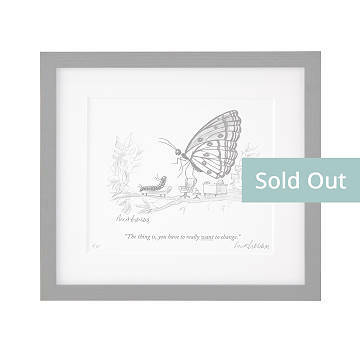 "Butterfly Changed" is one in a series of limited edition prints we're offering (just 10 of each), numbered and signed by him with the same pen he uses to draw. Framed in solid ash wood with a double-thick mat, it's a gift for the person who enjoys art with a wink. Printed and framed in Oregon. Beautifully matted and framed. Perfect size and addition to my art therapy based therapeutic space, which is very small/cozy. My high school aged clients and I love it! This is just so funny in a smart kinda way.